Herbs are a wonderful thing to add to your garden. Traditionally, herbs have been planted in a garden reserved only for them, but if you want to make the best of the unique forms and textures of your herbs as well as grow them to use in cooking or herbal medicines, they do fit nicely with other garden plants. Another way to approach your herb garden is to choose a theme. Some people like a kitchen garden with culinary herbs, a tea garden or a medicinal garden. You can even plant an herb garden themed by those herbs mentioned by Shakespeare or in the Bible. Still others may choose herbs of a certain color. For example, you could do a silver garden using horehound, lavender, wormwood and mugwort. Don't let these ideas limit you, however. Many herbs make great groundcovers or add vertical interest in any garden. Herbs that make good groundcovers around other plants include creeping thyme, lady's mantle and sweet woodruff. If you want some vertical interest among your other plants, mullein is a plant that will definitely get comments as it shoots straight up several feet, only to cover itself with small yellow flowers during the summer. If you want a traditional, formal herb garden, choose some low growing, compact herbs that are easy to manage. Rosemary, rue, thyme and santolina are a few herbs that would work well in a knot garden. Herbs can also add fragrance to your garden. You may want to plant some along with your vegetables, too, since many herbs attract bees when they flower. You may want to consult information on herb companion planting. Many herbs do a good job in encouraging certain plants to grow, while some just don't play well with other plants. Many herbs exist that have been used for centuries for special tasks. Some are used to dye fabrics, for instance, while others are used to make soothing lozenges for coughs. Many of these old fashioned herbs tend to look weedy in the garden. If you choose to grow any of these types of herbs, you may want to set them off by themselves so they don't mistakenly get pulled when you weed the garden. Other herbs can be very invasive, like mint. Mint is best grown in a container unless you don't mind as it spreads all over your yard. 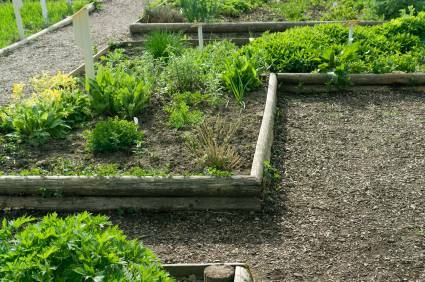 Many herbs will grow well almost anywhere, but they will grow even better if you can give them good soil with good drainage. If you have limited space or want to keep your kitchen herbs near the door, they also grow well in containers. Most herbs love the sun. They don't care for too much fertilizer or compost. They really prefer normal soil rather than one that has had too many amendments added. The one exception is adding sand to increase the drainage. Rosemary and many other Mediterranean herbs prefer good drainage. Many herbs like basil, dill and parsley can easily be grown from seed. Others are challenging to germinate, so it may be a better choice to purchase seedlings. Lady's mantle is one of the herbs that can be very difficult to start from seed. If you can't find the herbs you want locally, check online. There are many herb nurseries that sell seeds and plants of many herbs that are difficult to find. Herbs may be annuals, biennials or perennials. Annual herbs are usually started from seed. They produce their harvest in a single season. Biennial herbs need two seasons of growth. They only flower and produce in the second season. Perennial herbs will die back in the winter and then grow again in the spring. During the growing season, be sure to control any weeds around your herbs. Water as needed. Many herbs will tolerate a little dryness during the growing season. Harvest most herbs before they flower if you are collecting leaves. Flowers can be harvested at their prime. If you are harvesting roots, read about the specific herb about the best time to do this. Many herbs can be dried for later use. During the winter, perennials may appreciate some protection from the cold, especially if you usually get very cold winters. A good covering of mulch can do wonders. Other herbs may be tenderer, depending on where you live. In very cold areas, herbs like rosemary and oregano can be dug up and repotted to winter indoors. Come spring, they can just be planted back in the garden.